Oh man, we know second chances don’t come often in this lifetime — so we’re glad we’ll get another shot at meeting the Stephen Malkmus. Last time was after he and The Jicks played at Mercy Lounge in 2007? 2008? Can’t remember. We just remember being superfans asking for photos and saying things like, “Um, Mr. Malkmus, I think you’re the Beatles.” Hopefully we’ll be able to come up with something a little less weird when we re-meet the legend at Grimey’s on October 4th before they take the stage at Mercy Lounge. Seems like Matador and Grimey’s have a total crush going on right now. Just did that Girls webcast in-store a week or so ago and now this. We like. 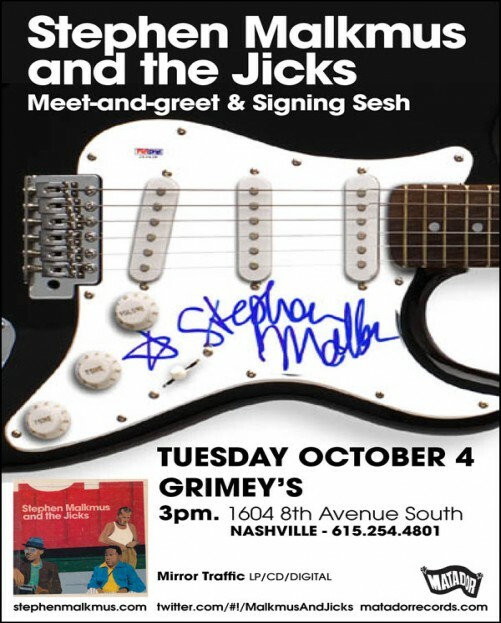 Catch Malkmus at Grimey’s at 3PM for signings and handshakes — and pick up your tickets here for the show later that night at Mercy Lounge.